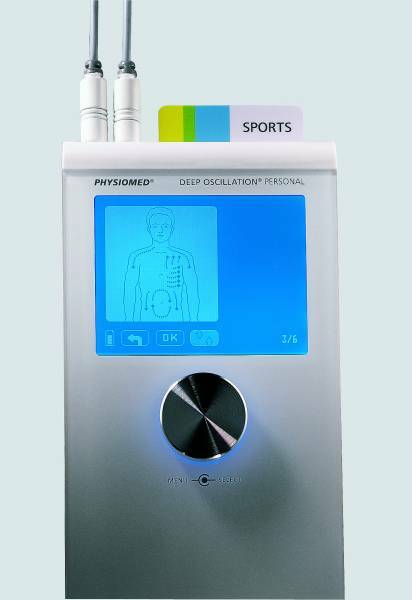 DEEP OSCILLATION®, developed by Physiomed Elektromedizin in Germany is an internationally patented therapeutic design which utilizes the forces of pulsed electrostatic attraction and friction to provoke oscillations, which act deeply on the tissues of the body from the epidermis down through the conjunctive and adipose layers and into the muscles. 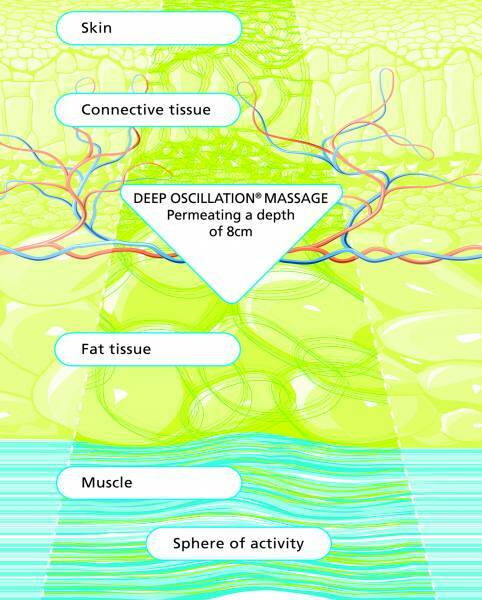 Hernandez Tapanes et al (2010) were able to prove, by diagnostic ultrasound, penetration of the oscillations up to an 8cm depth (see diagram). Observed physiological effects of the therapy include oedema resorption - Jahr S Et Al (2008) The therapy also limits the production of inflammatory mediators, especially during the treatment for chronic pain and more so during the treatment of fibromyalgia - Janik, H. et al (2010) strengthening of the cutaneous tissues - Korkina Et Al (2007), stimulation of the wound healing process Mikhalchik E, Et Al (2005), Trybulski R (2008). The telephone is answered between 9:30am and 2:30pm. Outside of these hours an answer phone is in operation. Rebecca has been working in the treatment of lymphoedema for 17 years and has strong national and international links. She was chair of the British Lymphology Society from October 2003 to October 2008 and is involved with the International Lymphoedema Framework Project. 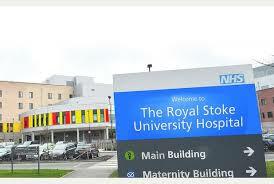 Rebecca also presents regularly at national and international conferences. Rebecca has many publications to her name, including a commissioned series of rare case articles for the Journal of Lymphoedema. She is also involved in a number of research projects which focus on the management of lymphoedema. 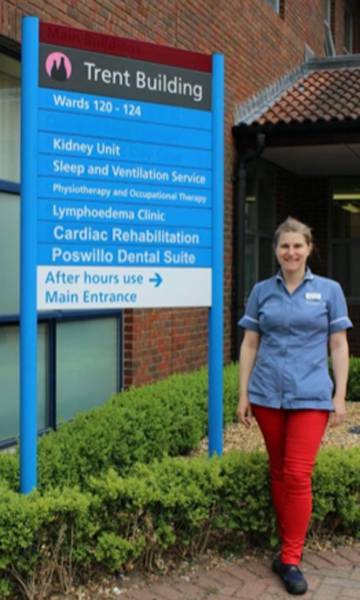 Rebecca completed her MSc in Lymphoedema in 2012, and as part of this carried out a randomised controlled trial in the use of deep oscillation therapy for breast cancer related lymphoedema. She is a fully qualified Casely-Smith and Leduc MLD therapist. Rebecca has won a number of awards including the Highly Commended Award in the Patient Involvement category of the Innovations in Lymphoedema and Chronic Oedema, Wounds UK award ceremony in 2009 and more recently she was runner up in the acute nurse category in the Pioneers of Care awards 2013. Referrals are accepted from any health care professional. If self-referrals are received, the patients' GP will be contacted for information.